Davit is a marine crane dealer with a complete line of quality standard Marine- and Offshore Pedestal Cranes to meet the needs of the Global Marine, Offshore and Gas markets. Call us today for a free product consultation and price estimate. Our experienced agents will help you figure out exactly what you need. Our product line also encompasses custom and specialty made Marine- and Offshore Knuckle Boom, Fixed Boom, Telescopic Boom and ROV Handling Cranes with Docking Head for ROV. Quality/Certificates: An increasing global demand for quality cranes in the Oil and Gas industry has set new measures by which businesses must demonstrate their abilities. Davit's suppliers' manufacturing facility has been assessed by American Petroleum Institute (API) and its Quality Management System has been approved to Design, Manufacture and Service Marine- and Offshore Cranes. All cranes are fully assembled and tested prior to delivery. 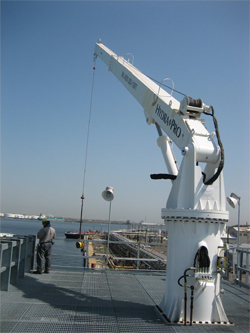 Davit Cranes provide unparalleled safety, quality and value. Oil Tankers and LNG Ships. Terminal Shore Power Electric Cable Handling. Stainless main heel joint- and boom cylinder pins with bronze bushings. Heavy Duty Planetary Drives. High torque motors and fail safe brakes. Braden and Gearmatic Planetary Hoist Winches. Walvoil and Hydranor marine grade valves. Hydraulic swivel (360° continuos rotation). Main- and color load gauge. Three coat marine paint system. ABS, DNV, Loyds, USCG and OSHA standards. Electro Hydraulic Powerpack for standard or hazardous locations. Diesel Engine Power Unit (Cummins, Detroit, Deutz, Caterpillar). Anti-Two-Block Systems (A2B) - mechanical or wireless. Stainless steel hydraulic tubing, fittings, adapters and hose ends. Power unit for remote or crane pedestal mounting. Fast line winch designed for personell handling. Emergency Load Monitoring Systems (EMLS). Rotzler, Pullmaster and Lantec winches. Winches with emergency load lowering. Stainless pump-to-motor mount shaft couplings. Wireless remote control (standard and hazardous location).